Many developers use Redis as a memory cache system for database queries. It allows devs to pull DB queries and store them in memory to cut down on future queries. 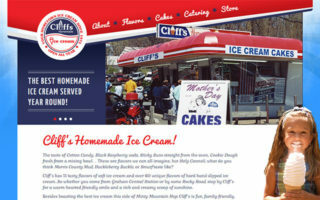 It’s a powerful platform that can really improve web performance. But learning Redis from scratch is no easy task. That’s why I’ve collected the absolute best Redis books that can take you from a complete novice to a competent pro in no time. Complete beginners will want a book that’s easy to read but also very technical. I suggest Redis in Action because it teaches Redis through real world exercises. You learn to build a distributed ad network and a social networking app with Redis’ caching engine. This is a challenging book for a complete newbie. But it can take you from a complete novice to a fairly advanced Redis user. Developers with some prior database experience will get a lot from Learning Redis. The book targets developers with no prior knowledge of Redis or memory storage caching. However it does rely on classic relational database models to explain some of Redis’ common features. The author starts with a quick intro to Redis along with a basic overview of NoSQL. 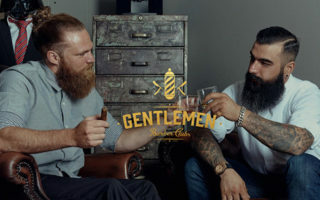 This leads into a tutorial for installing and configuring Redis on a local server, along with basic data imports for manipulating content in the database. 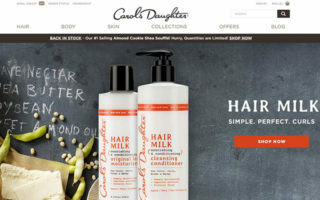 Later chapters get into much more technical concepts like master-slave data replication and a full example of Redis used in an e-commerce shop. This book explains all the key concepts with a mix of theory and practice. I’m also impressed with the volume and length of each lesson. For a 400+ page book this is one hell of an introductory guide. Just be sure that you’re somewhat familiar with basic programming and SQL databases before diving into this book. Or if you’re not then be willing to do some research on the side. It’s important to note that most Redis users have some advanced knowledge of technology and servers/IT. Getting into memory management and DB caching is tough without some prior experience working with databases. 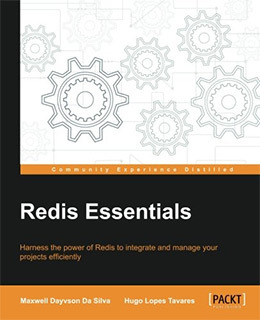 Redis Essentials aims to boil down this topic into 230 pages with a technical slant. 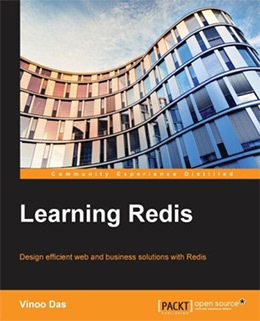 The book covers the most efficient workflows for Redis in daily use. You’ll learn about 3rd party tools like Twemproxy for caching and related clustering tools. The writing style is very technical and it moves quick. Each lesson covers a specific topic and they’re not always related to each other. This book gives you a solid overview of what Redis can do but it’s not the most practical guide for Redis newbies. The authors go into great detail connecting Redis with different web environments running PHP, Python, and Node.js. You should already have experience with one of these languages if you plan to run Redis on a web server. Other chapters get into security with SSL certs and user authentication. You’ll learn about all the different data types and how to pull them from a DB using Redis caching. Overall this is one of the most technical books you can get at a beginner’s level. But it still requires some background knowledge so if you already have some programming experience then you’ll be much better off with this title. 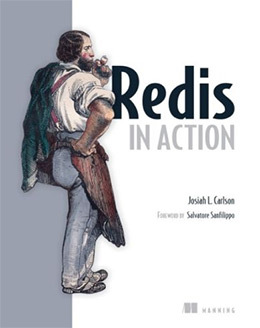 If you’re looking for a practical intro to Redis with real-world exercises then Redis in Action is the book you need. Over the course of 320 pages the author Josiah Carlson walks you through the basics of key-value storage in Redis and how to handle different data types. 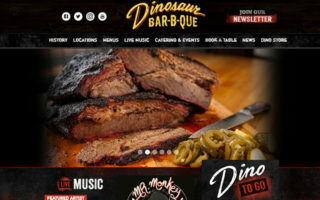 He covers a lot of solutions for connecting RDBMS to Redis or other NoSQL engines. Most of these solutions focus on real world exercises that force you to practice Redis locally. You’ll start by dissecting a typical Redis webapp studying all the layers in a web stack. Then you’ll learn how to apply advanced Redis features to create a database search and a custom social networking webapp. Each chapter explains best practices and real techniques you can apply for caching on the web. 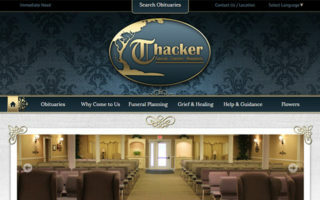 You’ll learn about everything from small time websites to huge enterprise databases. And towards the end you’ll get into techniques for scaling and even scripting over the Lua language. While this book is challenging it’s also a powerful intro to Redis for the real world. I would highly recommend this book to anyone just getting started. It may be overwhelming at first, but by the end you’ll walk away knowing how to apply Redis into any new web project. The development side of Redis covers a slew of languages and techniques based on your dev environment. 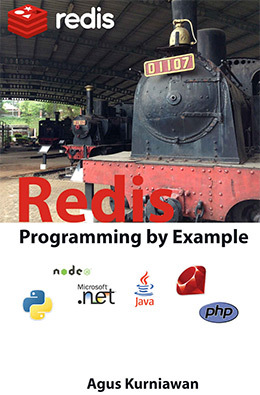 Redis Programming by Example addresses all of these languages including PHP, Ruby, Java, Node.js and C# .NET. With this book you’ll learn how to configure Redis on Windows, Mac, and Linux machines with a variety of programming languages on the backend. However it’s also dirt cheap and super short totalling just over 50 pages. This is not a complete dive into Redis. You will learn how to setup and configure the platform but you won’t learn all of the internals or extra tools for improved performance. Instead this book teaches the fundamentals of programming for building apps on Redis. It’s definitely a fun book and for the price you can’t beat it. However this should be used solely by programmers who want a broader look into Redis on the backend. Best practices are the suggested ways that professionals build & scale their platforms. 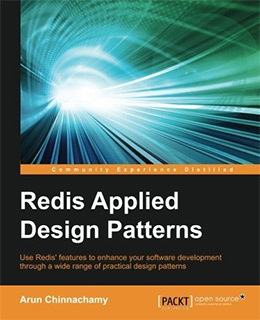 Redis has its own set of best practices which you can read about in Redis Applied Design Patterns by Arun Chinnachamy. This book spans 100 pages so it is a quick read. But the information is dense and the case studies are phenomenal. The author builds on top of fundamental Redis knowledge teaching you how to create a notifications system, how to use HyperLogLog, and how to check analytics data on the backend. There is no single best way to use Redis because each scenario has its own goals. But this book introduces a number of best practices that you can apply to any project to improve your workflow and improve your knowledge of Redis in the process. Before following this book you should have experience building custom applications from scratch and you should already understand a bit about database engines. However you can pick up this book with little prior knowledge of Redis and still work through the content if you have the tenacity to push through. With the skyrocketing popularity of Node.js it makes sense for developers to port a Redis client over to this platform. 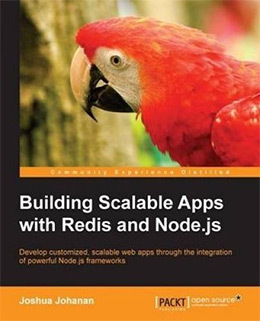 And with a book like Building Scalable Apps with Redis and Node.js you’ll learn how to install any of these clients and how to build Node.js apps on top of Redis. This book ultimately teaches you how to build scalable Node.js applications from scratch. The author assumes very little prior knowledge of Node or Redis, and both get covered in great detail. Each chapter covers a variety of new features and the author frequently builds upon 3rd party frameworks like Express.js and Backbone.js. Over many exercises you’ll pick up a natural workflow for JS-based development with Redis. Some chapters even get into Grunt.js for automating parts of your workflow. If you’re a web developer who wants to build scalable Node projects then this book is for you. Redis is optional for Node but your stack will be greatly improved with Redis attached. And even though you can pick up this book as a beginner I’d recommend this specifically for more experienced developers who already know their way around Node. This book is not a Redis-specific book. However the concepts and methodologies do pertain to a Redis stack where the goal is handling large databases with speed and efficiency. 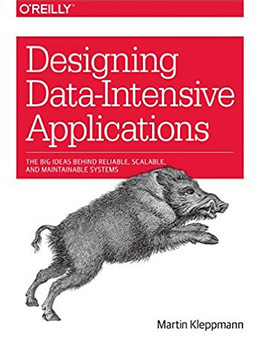 Designing Data-Intensive Applications teaches web engineers and architects how to build applications that easily scale. The author Martin Kleppmann is a skilled engineer who built & sold two major startups. In this book he covers the concepts of scalability and reliability when architecting a new project. The early phases of development are often the most important because they set the course for the rest of the project’s life. It’s harder to make big foundational changes when a project’s already online rather than earlier in the development cycle. Martin covers long term goals with caching and key-value stores like Redis. He also shares the most popular dev frameworks that can stand the test of time. This book is very long with 550 pages full of advice and best practices for scalable projects. If you’re a professional engineer or aspiring to enter that field I would highly recommend this book. 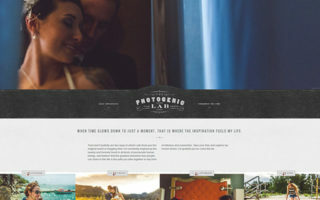 It’s fantastic for anyone who wants to build large websites that can scale and perform under pressure. Sometimes quick intro guides are the best resources to help you solve minor problems in your stack. 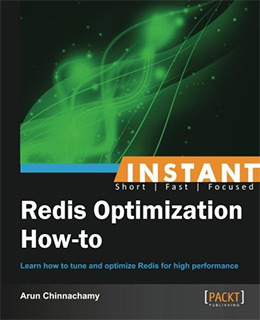 Instant Redis Optimization How-to by Arun Chinnachamy spans 56 pages of handy tips for optimizing your Redis workflow. The author shares his thoughts on optimizing memory usage and read/write times for larger data stores. He also shares code snippets and techniques for launching new projects on Redis to make sure you’re starting on the right foot. This book is pretty damn short and it’s certainly not the ultimate optimization guide. Unfortunately there are not many Redis-only optimization guides to choose from. But if you’re OK with a quick read this book does share many handy performance enhancing tips. Plus you’ll get a few quick exercises which remind me of Redis in Action, only slimmed down to a few dozen pages. Whether you’re a backend programmer or server architect there’s a lot to learn with Redis in your stack. Getting beyond a simple installation and caching setup requires new challenges and lots of practice. This is exactly what you’ll get in Mastering Redis by Jeremy Nelson. He talks about big data and shares topics for distributed data with Redis. He also shares tips and code snippets using C and Lua for server-side development. Each chapter has practical tips along with screenshots to guide you through the process. You’ll learn how to scale Redis properly regardless of the database size or function. And Jeremy shares tips for DevOps/Sysadmins who want better tools for monitoring memory usage on the backend. Overall this book is quite detailed yet short. It totals 366 pages which really isn’t too bad, although for an advanced-level book I was expecting more. Still it’s one of the best Redis books for intermediate-to-advanced users and the exercises are helpful to both programmers and sysadmins alike. This cookbook is a tad different than others because it offers a deeper look into common Redis features along with customized recipes. The Redis Cookbook is really small with only 75 pages in total. You might wonder why this is even worth the effort. Well the author assumes prior knowledge so there’s no time wasted re-explaining the basics. A lot of recipes simplify more advanced data structures and DB organization styles. You’ll find plenty of code snippets that run shell/bash, Ruby, and Node.js. You’ll learn some best practices for working over the Redis API including the pros and cons of each Redis client. The author covers many common pitfalls offering solutions on how to avoid issues during your development cycle. I was hoping this would have several hundred more pages. 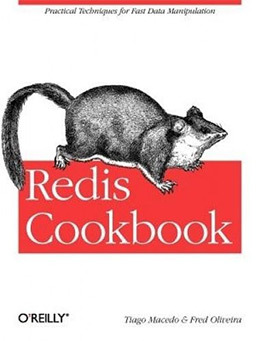 But a Redis cookbook is tough considering the variety of languages that connect to the API and the many 3rd party extensions. If you’re OK with the size and just want a quick book of advanced Redis features then you’ll be happy with this cookbook. Otherwise I’d wait for a new cookbook with more content somewhere down the line. It doesn’t take much effort to setup and configure Redis from scratch. The difficult part is applying Redis to different stacks and optimizing the development cycle to perform with large databases. If you’re brand new to Redis and don’t know where to start I recommend Redis in Action. It’s a great book from Manning that covers all the basics and teaches Redis with practical step-by-step exercises. 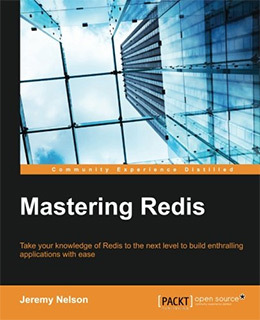 But there are many great Redis books to choose from, so you should find one that fits your current skillset and your preferred learning style.